An analysis of the video footage and images released by Boko Haram as they celebrated Sallah has been made with suggestions of fakeness. 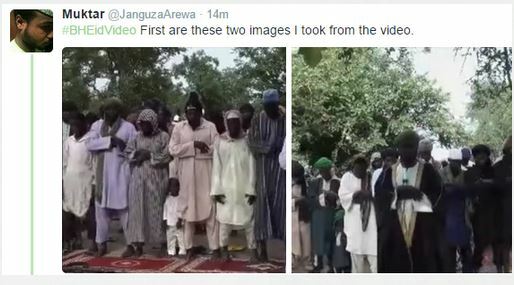 Click here to see the images of suspected Boko Haram members celebrating Sallah in Sambisa forest. This man just identified some irregularities and inconsistency in the new video released by Boko Haram, which clearly looks like a desperate attempt to fool Nigerians. They just wanted to paint a false picture that they are still standing strong in the Sambisa forest, despite the huge successes of our gallant soldiers. The man's claims seem valid to a large extent and a professional analysis by multimedia experts could shed more light on the claims of this intelligent social media user.